Darren Pond will be missing against Hitchin tomorrow. 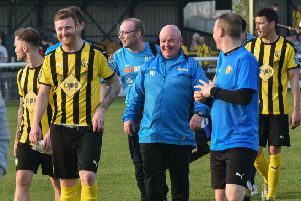 Leamington boss Paul Holleran has paid tribute to Slough Town and Chippenham after “phenomenal” starts to their Southern Premier League campaigns. Brakes lead the way by four points having played a game more than their title rivals. But with all three teams boasting an average of more than two points a game, Holleran said the standards they are keeping are unprecedented. “The three teams at the top, including ourselves, the amount of points on board already is phenomenal,” said Holleran. “I can’t imagine we can all keep that going. “In any other league, Slough, us or Chippenham would be seven, eight, ten points clear. “The gap will go up and down and there will be plenty of twists and turns. After their midweek match at home to Kettering fell victim to frozen pitch, Brakes saw a seven-point lead cut to just four when Slough overcame Banbury on Tuesday evening. And despite his side holding a nine-point advantage over tomorrow’s visitors Hitchin Town, Holleran knows the promotion picture can change in the blink of an eye. “Hitchin have carried on from last year and are right in the mix,” he said. “You can get nine points in a week. “It’s good to have points in the bag but I think the year we won it we were ten points behind Hemel at one stage. Brakes will be without Darren Pond tomorrow after he picked up his fifth booking of the season at Cirencester. However, the midfielder may have been a doubt anyway as he has been struggling with a bad cold this week.